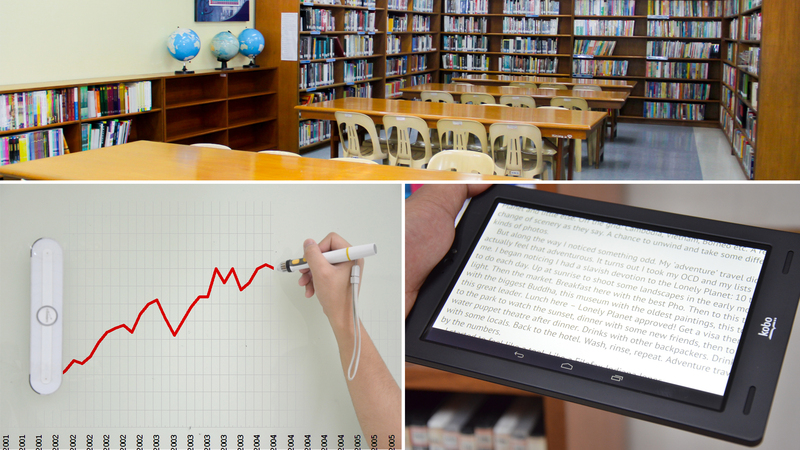 In acknowledgment of the dynamic demands for scientific research and study in secondary education, the Malayan High School of Science’s (MHSS) library, the Learning Resource Center (LRC), has raised the bar in creating, updating, and maintaining a trove of academic resources for students and faculty alike. The LRC boasts a comprehensive network of scholarly resources to bolster teaching, learning, research, and innovation at MHSS. According to Gianina Angela Celine O. Cabanilla, Chief Knowledge Officer of MHSS, the LRC connects faculty and students—wherever they are—to the best scholarly information available through the website of LRC and its affiliate libraries. "Expert staff, state-of-the-art technologies, and abundant resources serve every part of the school, bridging disciplines and communities across campus," she added. This increased connectivity also works with external sources to add fresh content to the LRC. Due to its innovative partnership with the academic libraries of its sister schools, Mapúa Institute of Technology and Malayan Colleges Laguna (MCL), the MHSS community is able to access an even wider collection of materials. In turn, scholarly works by MHSS students are made available virtually, allowing for a free exchange of knowledge among some of the brightest scientific minds in the country. Interested researchers can remotely access Mapúa Library subscriptions, and utilize dedicated online portals such as the Online Public Access Catalog. "Each year, the MHSS community downloads hundreds of items from its sister libraries in Mapúa and MCL, and performs a hundred searches on scholarly databases," Cabanilla shared. The LRC gives students and faculty access to several online libraries and web-based applications for electronic books, technical papers and other references. Some are dedicated to major scientific disciplines, specifically engineering, such as the Wiley Online Library, AccessScience, and McGraw Hill’s Digital Engineering Library. The LRC also supports scopes of research in other academic fields as it provides access to resources like Britannica Online-Academic Edition, and the Gale Virtual Reference Library. Electronic journals that delve into hundreds of fields of study are also within easy reach. The LRC subscribes to CABI, ASCE Library, ASME Digital Collection, and Art & Architecture Complete, among several other e-journal databases. “The Library’s interdisciplinary research and development efforts aim to tackle complex challenges in developing new, sustainable models for producing, using, managing, sharing, preserving, and discovering scholarly information in this digital age,” Cabanilla said. With this, the LRC is fastidious in preserving its vast wealth of knowledge. Cabanilla noted that the innovations of the LRC ensure that it is “at the forefront of disseminating high school research and scholarship and of ensuring its accessibility for future use, tackling the complex issues of preserving digital information.” The MHSS School Archives and Special Collections serve as a dedicated space for MHSS founding documents and the personal papers of noted faculty, students, and alumni. MHSS Head Librarian Kathy A. Padre emphasized that at the end of the day, the LRC is still primarily dedicated to the young students of MHSS. “The LRC must be conducive to learning by providing furniture and equipment suitable for students. They study better and longer when they are at ease, rested, and comfortable,” Padre stated. “Library locations offer welcoming spaces for quiet study or collaboration. Several are even virtually accessible 24/7. The LRC, as well as its Mapúa and MCL counterparts, sponsors school events each year, including classes, wellness events, and a school-wide reading and book fair program,” Cabanilla concurred. With the innovations and features of the LRC, it is unlikely that library use at MHSS will go out of style anytime soon. “Libraries and librarians remain important elements at MHSS. They are instrumental in giving students direction and structure when using the library to balance fun and learning,” MHSS Principal Jocelyn Antiporda noted.